A hydro corridor is at the heart of a movement to link up the city's green spaces. A map of Toronto’s existing and developing urban greenways. Image courtesy of Park People and the Centre for City Ecology. There are certain corners of Toronto that act as incubators for urban design—sites such as the Davenport hydro corridor, which inspire activists and community members to imagine new development opportunities. The corridor is the focus of the Green Line initiative, which is bringing together non-governmental organizations and members of the public to help create a “greenway” between Spadina Road and Lansdowne Avenue—a linear green space that links parks and parkettes, facilitating active transportation such as walking and cycling. Park People has teamed up with community members to found Friends of the Green Line in hopes of building support for a greenway along the hydro corridor. But the organization is interested in how the rest of the city is developing greenways, too. “We are actively working on a specific project called the Green Line, but as part of that it’s always important to look at the broader city-building context,” Hill says. “And within Toronto, where are the other efforts to create extended green spaces?” That’s why Park People and the Centre for City Ecology have produced a map of Toronto’s existing and developing greenways, showing where they lie in relation to each other and to public transit. Opportunities for creating greenways and active transportation corridors are often found in underused areas that are home to big pieces of infrastructure—or once were. 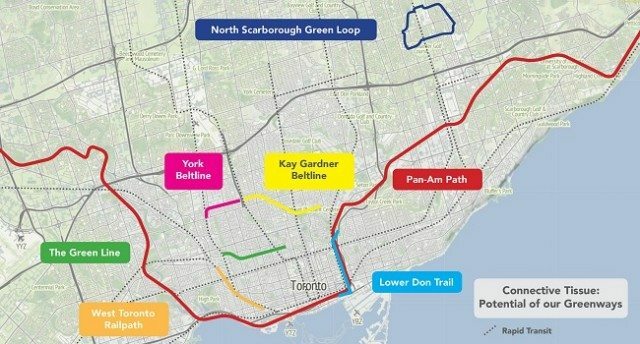 The Green Line is located in a hydro corridor, the Kay Gardiner Beltline used to be a railway, and the West Toronto Railpath runs along a rail corridor that’s still in use. Even natural corridors, particularly the ravines along the Don River, are often readymade for extended greenways. The first step toward spurring more greenway development is to sell the idea to community members. Park People and Friends of the Green Line have been engaging residents who live nearby the Davenport hydro corridor, discussing its potential at events such as a June 19 walking tour. On July 8, Park People and the Centre for City Ecology hosted an event with Ryan Gravel, the urban designer behind the Atlanta BeltLine, a 35-kilometre former railway loop encircling downtown Atlanta that is currently being transformed into a linear park. Going back even further, local firm Workshop Architects (some of whose staff members are now involved with Friends of the Green Line) engaged the public with the Green Line Ideas Competition, concluded in 2013. Organized with the support from the Canada Arts Council, the Ontario Association of Architects, and Spacing magazine, the competition invited architects, planners, artists, and lay people to submit their visions for the Green Line. On August 7, a City study of land use, urban design, and potential improvements along Dupont Street will deliver its final report. Although the study didn’t specifically look at the Green Line, proponents are hopeful the final report will recommend that, at the very least, the greenway be examined in a future study. More greenways and active transportation corridors mean improved access to parks and improved mobility between different parts of the city—particularly for those who get around without the use of a car. They even have the potential to spark private sector development by offering more and different access to neighbourhoods.